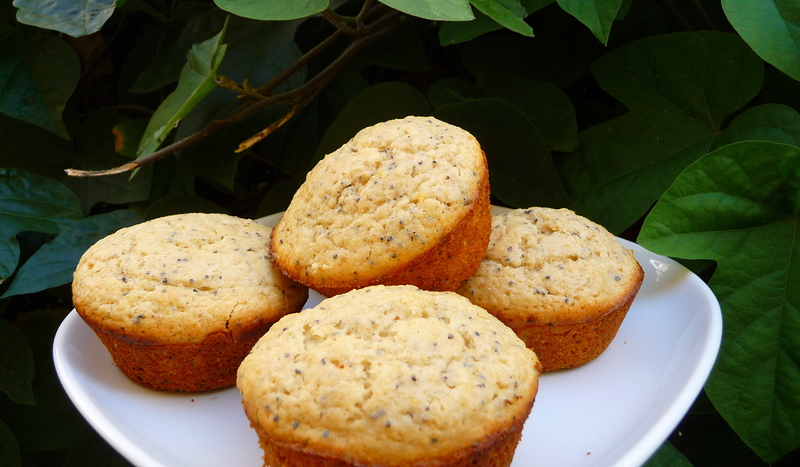 Don’t Lemon Poppyseed Muffins just make you envision a lovely summery brunch? I like to take a moment and picture cloth-lined baskets filled with these lemony treats cascading down an old barn table, accompanied by pitchers of mimosas, plenty of butter and jam. You’re drooling, right? I know. Me too. We should plan a brunch soon. In a field. With a big barn table. You have one of those, right? Righttttt. Alas, we must settle for a restaurant in West Hollywood with a tree in the patio. But the mimosas are good. The muffins are great. Life is good. These little lovelies get quite the kick from an all natural lemon extract. Not the bottled juice yuckiness, just the absolute essence of lemon in a little bottle to complement the real lemon squeezed into the mix. Recipe after the jump! Pour into greased muffin tins, bake at 375 degrees for 18-20 minutes. Makes about 15 minutes.